Soft4Boost Any Uninstaller is a reliable utility that can uninstall applications from your computer without leaving any traces behind, like it typically happens with default uninstallers. Compared to the system built-in uninstall capabilities, this program also scans the computer to detect and remove all files and registry entries that uninstalled apps usually leave behind. 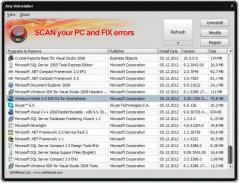 Soft4boost Any Uninstaller scans your machine and detects all installed programs, listing them all in its main window along with information like their name, publisher, version, size and install date. For some program, the tool can also repair or modify them, should you need such capabilities. Removal tasks complete very fast, although the scan process that detects installed products may take a while depending on how full your hard drive is. If you’ve been searching for a reliable uninstaller that can purge leftover files and Registry items left by uninstalled apps, you should definitely try Soft4Boost Any Uninstaller.